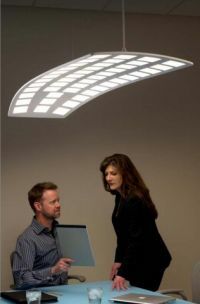 Acuity Brands launched new editions of their OLED luminaries, that use the latest generation OLED panels. Acuity is using LG Chem's panels, and those newer panels offer a higher CRI (85-90), longer lifetime (30,000 - 40,000 LT70) and are available in 3000K, 3500K and 400K. Currently Acuity offers four luminaries - the Trila, the Revel, the Canvis and the Kindred.